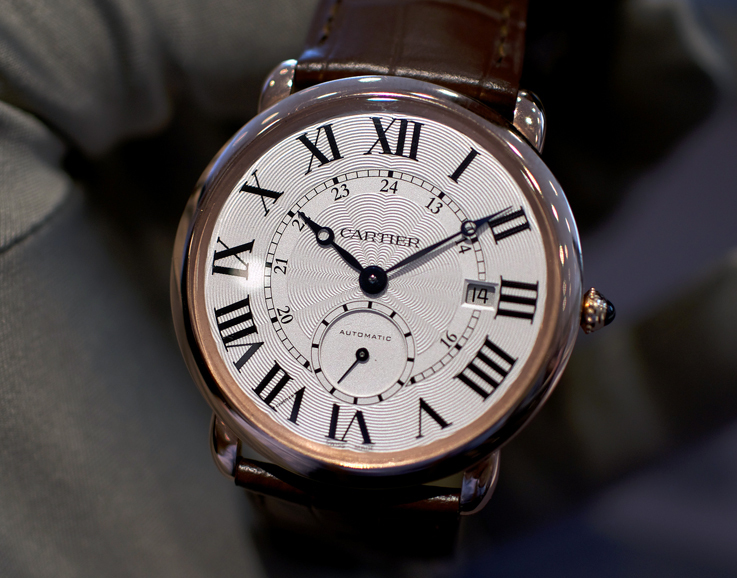 During the last few years, the larger watch trend was dominating the Cartier watch collection quite a bit. We have seen watches like the first piece in the Fine Watch Making Collection, the hefty 46mm Ballon Bleu Flying Tourbillon, the really cool extra flat 46 mm Ballon bleu X-tra flat and of course the many high end pieces that are often housed in a 42mm case or larger. While some case designs were made fashionably large, others had to be made in XL, just to house a complicated movement. 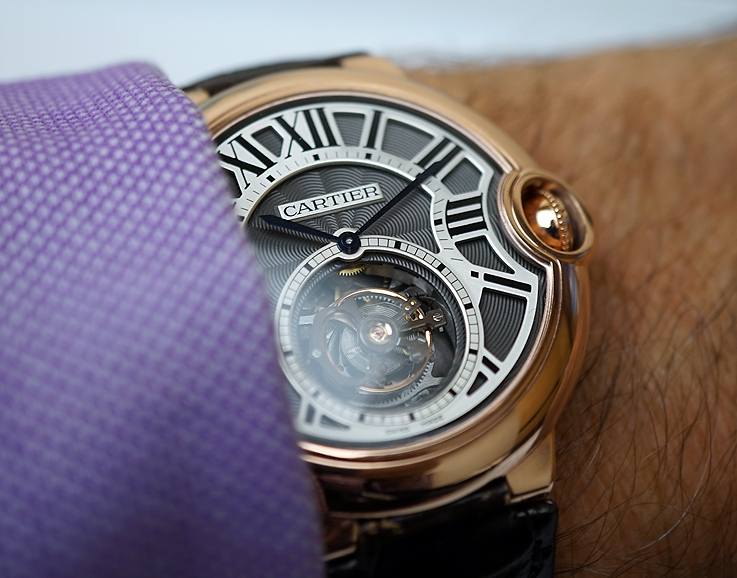 Of course Cartier have realised that part of their clientele prefer smaller watches for being more discreet, or maybe because these moderate sizes are more comfortable to wear, especially on a smaller wrist. It was only a matter of time. We reported already about the new medium Tortue models, so now let me tell you about some more smaller models, that are part of the 2014 collection. The fact that we see a change in the collection this year, doesn’t of course mean an end to the large watch trend. In fact, it might be more accurate to say that we can’t really speak about a trend anymore. Larger watches are here to stay and will probably remain in the catalogue, next to their smaller siblings. Let’s have a look what’s it all about. The 47mm extra plat Ballon bleu, that was originally released in 2011, with a classic dial and in a limited edition of 100pc, with blue dial, now has a smaller brother at 40mm. This is a superb looking watch with a grey dial or classic cream colour guilloche dial. The movement has not changed and the watch is still powered with the well known mechanical hand wound 430MC. 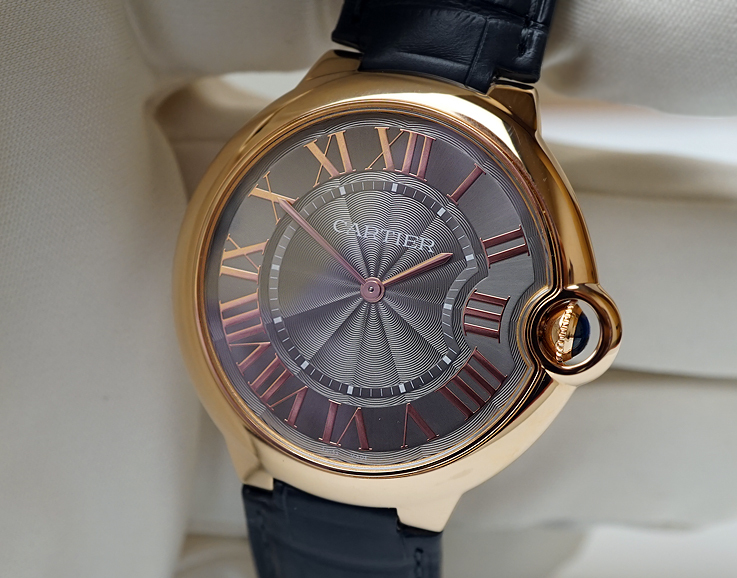 The version with the grey dial may not suit everybody’s taste, but it is looks absolutely amazing, still very much Cartier and just that bit more extravagant. Also available and an ideal companion for the late hours, is the diamond version, with classic dial. Quite sensational in my opinion are the new Ballon bleu flying tourbillon watches. 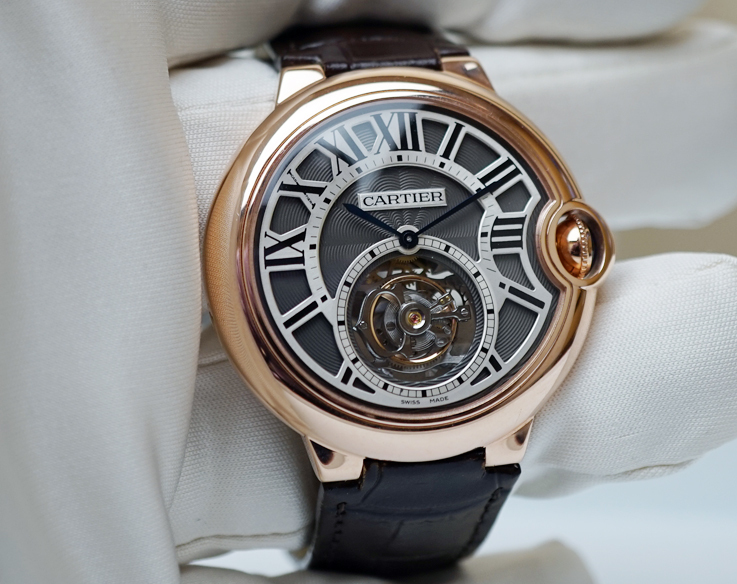 Originally released in 2009 in a 46mm case, Cartier has now managed to fit their first tourbillon caliber, the 9452MC with 50 hours of power reserve, in the very wearable 39mm case. With the classic open worked layered dial, the proportions on the dial look absolutely right and it even comes with a tourbillon. Certainly an elegant and beautiful piece that can easily be worn under most circumstances. More special and very hard to find is the limited edition with a deep translucent blue enamel covered guilloché dial, satin-finish cartouche, black hour circle on a sunday base without numerals, to keep the dial as clean as possible. 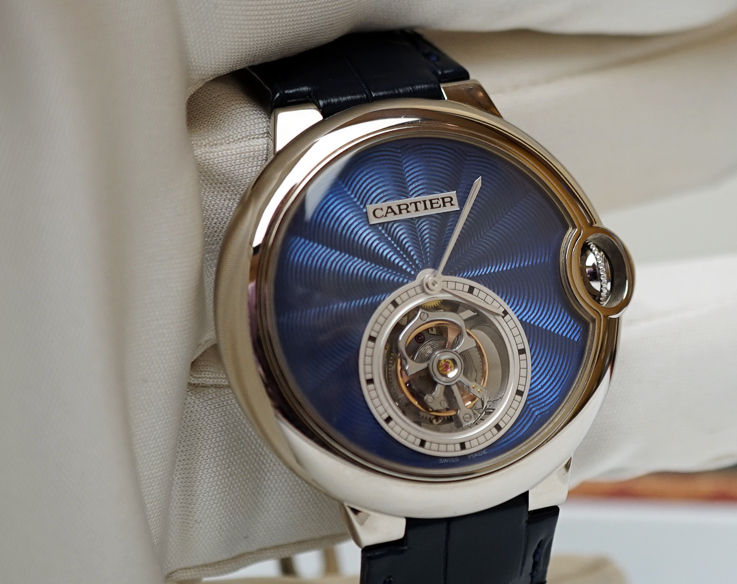 For those who don’t fancy the Ballon Bleu as a model, there is still the smaller Rotonde de Cartier Tourbillon with a 40mm case, from the previous collection. Less outspoken and more business looking watch, with the same mechanical In-house caliber. 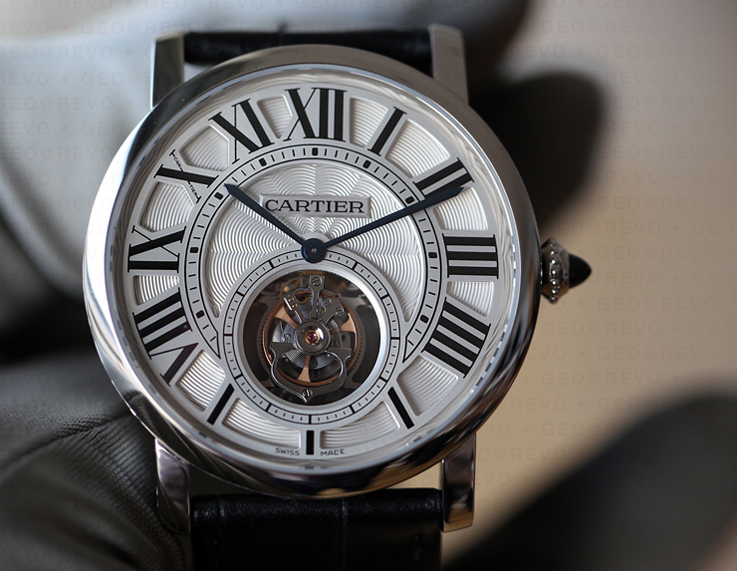 The classy Rotonde de Cartier 40mm is another alternative for a wearable more dressy watch. With the very nicely designed seconds @ 6, complication and the date window, it is a prime example of how a discreet men’s watch should look like. 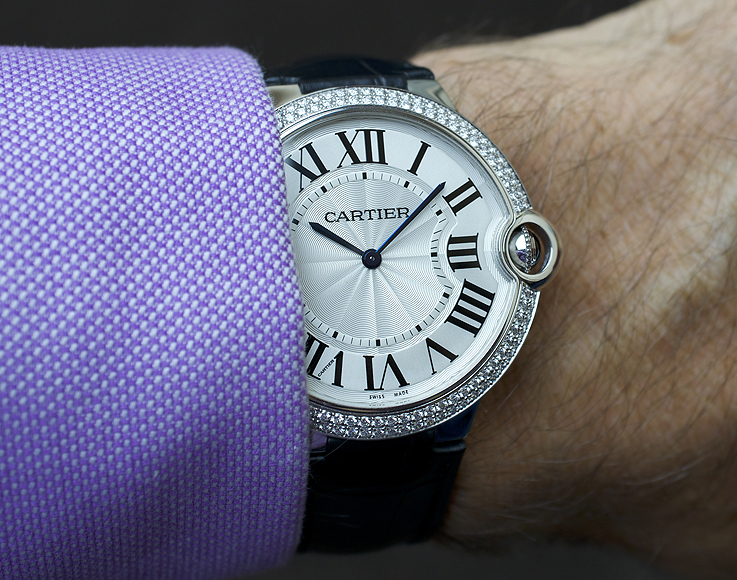 Many have asked for smaller models and Cartier’s first response has certainly been very satisfying. I am sure La Maison will continue to surprise us in the near future. –GEO is contributor of Revo-Online & Revolution Magazine and passionate about Cartier, independents and fine watchmaking.